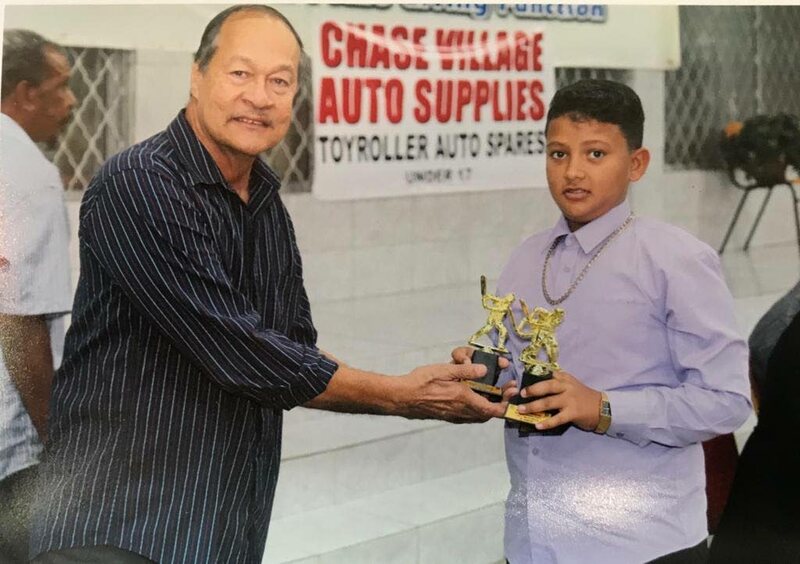 Lambert Lee Ahyen, left, presents an award to Timothy Nathaniel at the Caroni Cricket Association award giving function at Presentation College, Chaguanas on January 12. PARTICIPANTS in the Caroni Cricket Association were honoured for their brilliant performances last season when the association held its 42nd award giving function at Presentation College, Chaguanas, on January 12. A total of 32 clubs participated in the 2018 season. At the function, $70,000 in prizes, medals and trophies were distributed. Debideen Manick chaired the function, which was attended by MP Ganga Singh and Pradeep Vishnu, who represented Minister of Sport and Youth Affairs Shamfa Cudjoe. It was well attended by the various sponsors namely Chase Village Auto Supplies, Felix Eastman, Toyroller Auto Spare, Bert’s Sports and also the clubs of the Association. Registration for the 2019 season is open and forms can be collected at Bert’s Sports Centre. Deadline for registration is February 2 and for further information contact 672-4793 or 397-2136. Reply to "Top cricketers honoured at Caroni Cricket Awards"